Kama Sutra Original Oil Of Love - Rub a few drops of Kama Sutra Oil of Love into your lover's skin and watch their passion rise. Kama Sutra Original Oil Of Love KS10001 - Embark upon a new adventure in body exploration using the Oils of Love as your guide. Silky to the touch and enchanting to the taste, a whisper-soft blow on these delicately scented oils warms the skin with a tingly glow. Where the hand first discovers their presence, the lips are sure to follow. The water-based oil is hypoallergenic, dermatologist tested, and condom safe. Although the oil appears tinted in the bottle, Oil of Love is clear on the skin and washes away easily with soap and water. 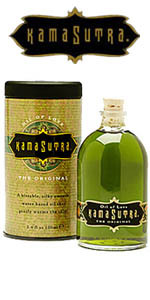 Kama Sutra Original Oil of Love Flavor Description: A delicate blend of chocolate, vanilla and exotic cinammon. You chose each other for life; commemorate that choice with a celebration of your love. Each Sweet Celebration Box is designed to transport your senses, allowing you to revel in the sweetness that comes from finding that one perfect partner in life.